With all the free time I've had lately, I've been trying to get more serious about my fiddling. 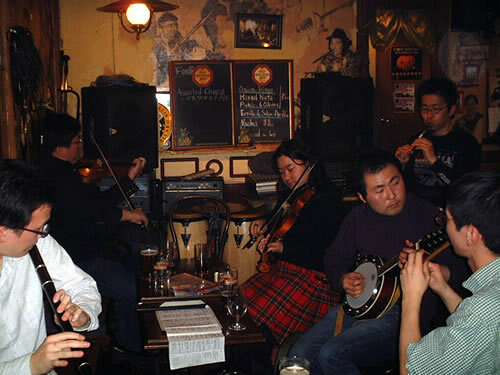 Tokyo has about 7 different Irish sessions that I know about, and I've been to all of them except one. 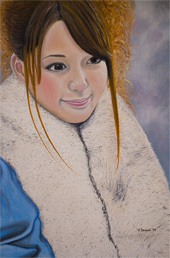 So far the most enjoyable one was the session in Ueno, at the Warrior Celt pub. The pub may be small, noisy and crowded, but session members get half price drinks and the other members were very friendly and welcoming. During this particular session, there was a family of four watching us play. I found it a bit strange to see kids younger than 10 inside a pub, but they were very enthusiastic about the music, asking me many questions about violins. The girl, about 6 years old, and her mother even asked me if they could hold my violin for a minute. Before they left, the father came up and thanked me profusely, bowing several times. I almost felt like I was famous or something! Chris and I go way back, we met in University where we did all kinds of crazy stuff like study Linguistics, take Japanese classes, and go tree planting in Northern Canada. That's where we met actually. The two of us would practice our Japanese while sticking tree saplings in the ground, to the entertainment and consternation of the beavers, blackflies and our fellow tree planters. Anyway Chris used to live in Japan years ago and finally came back for a visit in March. I didn't see him much as he was also here on business, and had a lot of people to see, but we did hang out a few times. 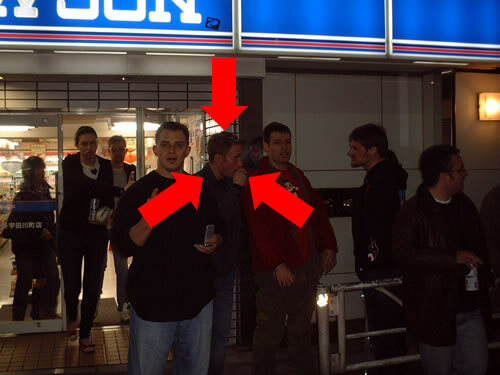 Here we are in Shibuya in front of a Lawson convenience store following the grand tradition of drinking beer and chu-hi's on the street. It was a busy month in terms of friends visiting. Alex, another good friend who also lived in Japan previously, came to stay for about a month as well. Hanami season is here again! After a late start due to strangely cold weather, the cherry blossoms finally came out. Kumi and I went to look at the trees twice, once in the day and once at night. 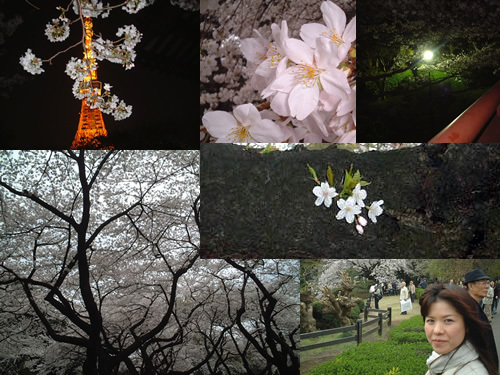 Despite what you may think, night time hanami viewing is very popular, with people heading to parks in the evening then drinking till late at night under the cherry trees. In the dark, and with the park lights on, the hanami trees take on a ghostly, mysterious look. 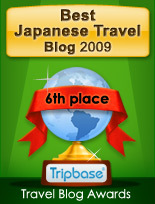 To check out the trees in the daytime, we headed to Shinjuku Gyoen, a famous park that makes you pay to get inside. It was worth it though as the park is huge, beautiful and not too crowded even on a Saturday. Till next year cherry blossoms! We're famous! 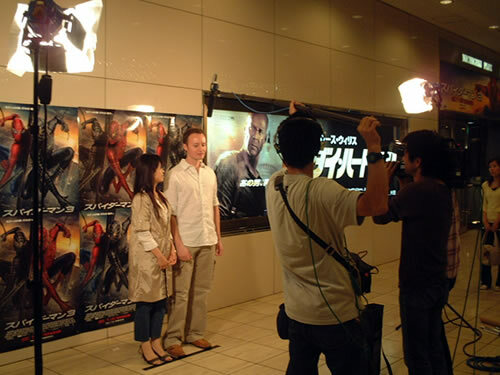 After seeing Spiderman 3 (which I thought was only so-so), Kumi and I were accosted by this TV crew who wanted to interview us about what we thought of the movie. We were like 'wow, yeah, cool,' and all that, but things didn't go quite as we hoped. Instead of asking normal questions they came out with puzzlers like: 'In three words or less, describe the most moving scene in the movie'. Barely enough room for an adjective. As well it was all in Japanese, so Kumi was trying to translate things for me and I was asking her questions, we were having our own little discussion on camera trying to sort things out. Probably not the smoothest take in history, but maybe we'll get a one second clip. Supposedly on all channels starting around May 24th. Let me know if you see us! 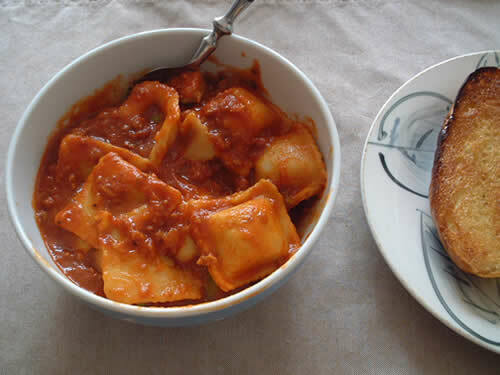 Ravioli! Just another thing that's practically non-existant over here. I grabbed a couple cans of Chef Boyardee's finest when on my Canada trip, and stuffed them in my suitcase intending to eat them in Japan. Checking my bag at the airport though, some customs official asked me what the metal containers were in my bag. 'Ravioli' I answered. He shook his head and told me I'd have to get rid of it, that ravioli was not allowed to be taken out of the country. At my look of confusion and dismay he started laughing, saying he was just kidding. Uhhh, right. Jokes in airport security? I guess there's a first time for everything. More culinary delights! 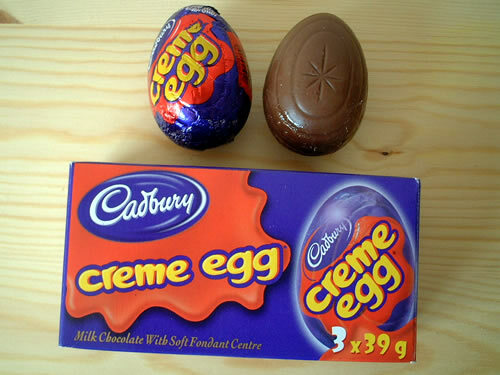 In the same league as Loblaws cake, Cadbury's creme eggs fall into the category of things sweet enough to make most people gag. Inside the chocolate exterior is a white and yellow creme (supposed to resemble an egg I suppose) that's approximately 1 trillon times sweeter than sugar. Kumi couldn't even finish one and donated her package to me. Hooray! The Cadbury rabbit only lays these eggs around Easter so make sure to stock up. I've been meaning to get an oven for the longest time, but kept putting it off. Whenever I started thinking about it I was like, what am I really going to do with an oven? I don't really have much time to cook as it is. Still, I wanted one, so I finally went out and got a fairly cheap model, (if you consider $200 to be cheap). 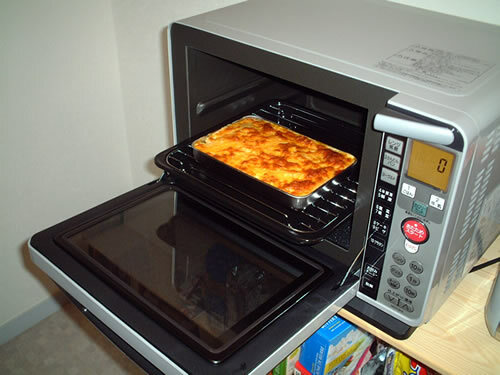 It's actually an oven/microwave/grill all rolled into one, hooray for technology! Now that it's here I'm of course glad I got it. The first thing I did to christen it was make a lasagna with some help from Kumi. I have no idea why, but trying to find a good lasagna in Japan is like searching for the Holy Grail on the moon. Anyway after a rough start with the noodles, our home baked lasagna turned out to be pretty damn amazing if I do say so myself. I also made some garlic bread and opened a nice bottle of red wine and voila, another masterpiece from Mike's kitchen. I'm now officially a paper driver in Japan, but I'm still a bit unsure why I even bothered. Though it was actually much less hassle than I thought. 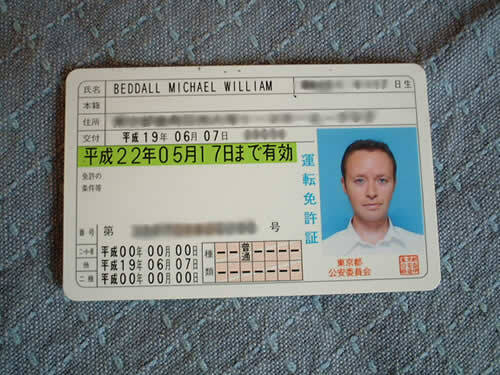 Aside from a bit of red tape at the beginning I had to put up with, like getting my licence translated into Japanese, and paying the fee, it was surprisingly easy. Too easy. Jason, being American, had to take an eye test, a written test and a driving test before they'd let him on the roads, but me? Aside from a 10 second eye test which I seemed to fail no less, they just handed the licence over to me like they'd been waiting for years for me to come pick it up. Apparently this is because Japan and Canada (and a few other countries) have some kind of special driver's licence 'exchange' program or some such. Seems kind of funny seeing how we don't even drive on the same side of the road. Anyway, so where am I off to? Hmmm... now that I have it, I find myself quite unmotivated to use it.... Who wants to drive in Tokyo anyway? I've never had much success with plants. After about a year, my aloe plant has seen better days. 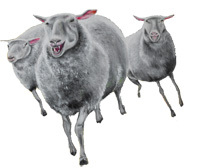 To get an idea of how it looked a year ago roll your mouse over the picture. Once fresh and vibrant, it now looks more like some sad octopus in a forgotten fishtank. Just re-potted it a couple weeks ago, hoping to save it from growing itself to death. Don't know why, but the thing grows like mad. Never re-potted a plant before either, so I kind of tore the poor guy out of the original pot and stuffed it into this oversized blue one, which as you can see fits the black vase nicely. It then proceeded to turn brown and I thought the end was near. However, somehow it recovered and new leaves continue to pop out. I wish it wouldn't droop so much though, kinda depressing to look at now. 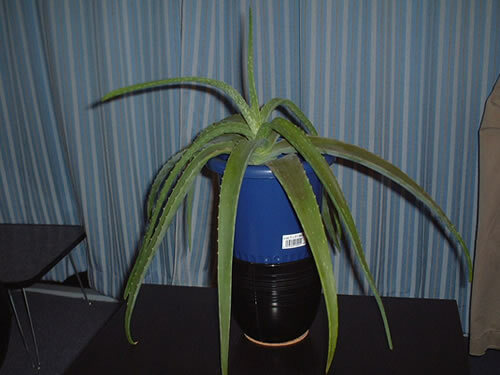 Any aloe experts out there with advice?